On my Trailex trailer I have decided to remove the bottom of the keel trough and replace it with rollers. The rollers with brackets are available from Trailex for $48.00 apiece. John has approved of the rollers except to say that the purpose of the keel trough is to guide the keel during recovery, but the trough is made up of three separately bolted-on boards so I was able to easily leave the sides in place. The only problem is the roller brackets would force the sides out too wide as you can see here with the sides removed. Fortunately the tops of the brackets are sloped inward so the side boards can be moved up and inward quite a bit. Here a side board has been replaced and you can see why I could not raise the board quite to the top of the bracket--I would not have had any wood to attach the lag screw. The rearmost roller is mounted on slotted brackets so all I had to do was slide it up. Also on the two rear brackets I was able to slightly bend the boards inward to bring the opening width down to the original 6 inches at the crucial rear entrance point. At the forward two rollers the width is closer to 8 inches, but as I said the sides are close enough to prevent the keel from dropping down and scraping on the bracket, and the extra width should not create a problem. So far I am very pleased with this mod. Now the keel does not sit on wet carpet, and I can easily get at it for inspection, painting, or repairs. By rolling the boat slightly back or forward I will be able to get to every inch of the keel. I will update the post if any problems raise their ugly heads later, but for now I highly recommend this modification. Nice modification. A thought would be to cut a slot in the side wood pieces. They would fit over the bracket holding the roller. That way you may be able to go back to the original hole on the wood to trailer frame bracket and have the wood closer to the side of the roller. But you said the keel would not slip onto the side of the roller and get scratched. Just something to think about. Anyway I saw your boat on your blog in the water! She looks great! Thanks. I thought about the slots but decided against cutting into the carpet, especially after I was able to bend the rear ends of the boards back to the normal width (the roller is on the back side of the beam, not touching the boards). Still, when it comes time to replace the carpet I may cut those slots then. It'll make the whole thing better and neater. One important point I forgot to mention. 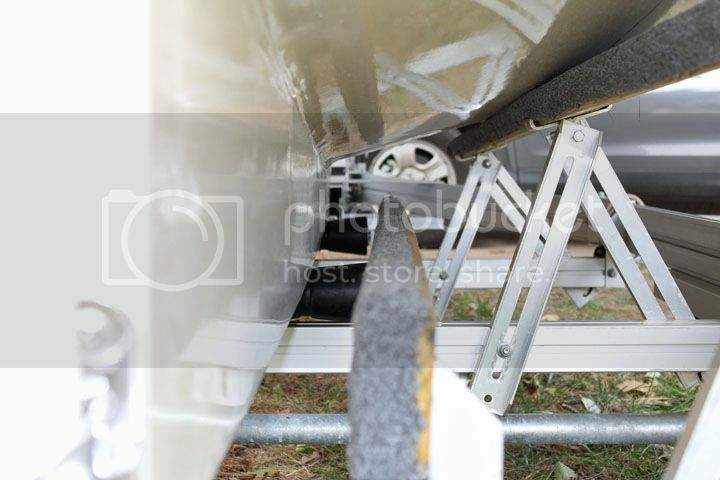 If you do decide to install the rollers in place of the bottom board, set the trailer's bow roller so the keel bottom center roller is below the centerboard. You would not want the center board to drop while rolling down the road! Also, I read it is a good idea to slightly loosen the centerboard pendant when the boat is on the trailer to take the strain off the pendant. So if you do that, the centerboard needs something to support it. How many rollers support the keel from underneath? From your pictures it appears three and then a forward small roller to stop the keel nose block. Just can't quite tell for sure from the pictures. I'm modifying a trailer and really like your idea for keel inspection and drying out. Your blog has and continues to be a huge help as I get closer to completion...thanks! There are three rollers under the keel. One was already there at the rear end of the keel trough. I ordered two rollers with brackets attached from Trailex, $40.00 each. After the bottom keel-trough board was removed, there were three sets of t-slot nuts left in the trailer frame. One set at the rear (no longer used), one set in the middle and one set forward. I used four of the six bolts that came out of the trough board brackets to support the new roller brackets at the middle and forward positions. Of course I had to launch the boat and leave it in the water while I made these modifications. As I recall, the only tool I needed was a 9/16" ratchet. I took a long straight-edge along to align the rollers, but found I was able to do a better job by eye. I believe it is important to get the rollers closely aligned vertically to avoid undue strain at any one point on the keel. Thank you very much for the detailed description. I agree with you that the rollers are much better for both the inspection, repair and to dry the keel. I'm going to set-up my trailer the same way. I have been following Dana's trailer modification posts. I will be ordering my trailer in February - and will also order the rollers per Dana's experience. I really like the access to the centerboard that provides. Thanks for the 'value added' idea, Dana. You wrote in an earlier post on this thread: "One important point I forgot to mention. 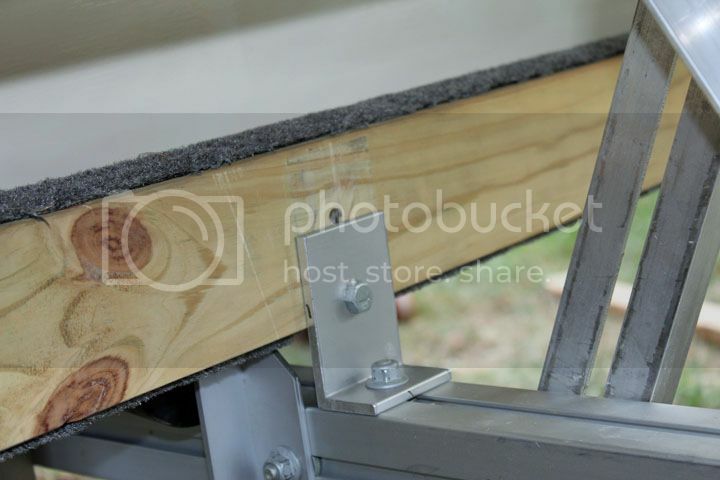 If you do decide to install the rollers in place of the bottom board, set the trailer's bow roller so the keel bottom center roller is below the centerboard. You would not want the center board to drop while rolling down the road!" It is possible to allow the PocketShip's keel to slide further forward on the trailer either by lowering the bow-stop roller such that it contacts the boat closer to the waterline (i.e., further below the bowsprit - but decreasing the ability of the bow-stop to prevent the boat moving forward in an accident), or moving the entire bow-stop roller support assembly forward on the trailer tongue, but I'm curious how your trailer is set up. 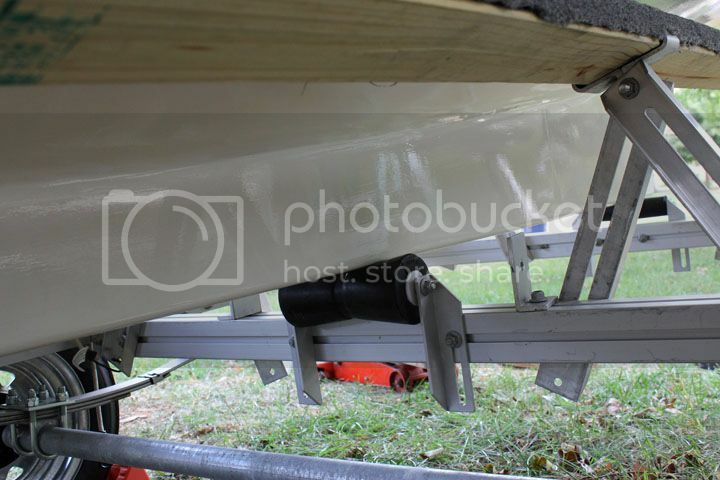 Would you mind posting a side-on photo of your trailer with the boat loaded, and note the distance from the trailer tongue to the bow-stop roller - or some way for us to be able to duplicate your set-up without repeatedly loading and unloading the boat to make trailer adjustments? come close to the car but it does prevent fully opening the rear door.